Rudolf Ludwig Carl Virchow (/ˈvɪərkoʊ, ˈfɪərxoʊ/; German: [ˈfɪɐ̯ço] or German: [ˈvɪɐ̯ço]; 13 October 1821 – 5 September 1902) was a German physician, anthropologist, pathologist, prehistorian, biologist, writer, editor, and politician. He is known as "the father of modern pathology" and as the founder of social medicine, and to his colleagues, the "Pope of medicine". He received the Copley Medal in 1892. He was a foreign member of the Royal Swedish Academy of Sciences and was elected to the Prussian Academy of Sciences, but he declined to be ennobled as "von Virchow". 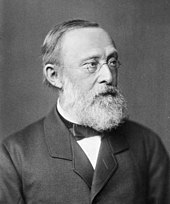 Virchow studied medicine at the Friedrich-Wilhelms Institute under Johannes Peter Müller. He worked at the Charité hospital under Robert Froriep, whom he succeeded as the prosector. His investigation of the 1847–1848 typhus epidemic in Upper Silesia laid the foundation for public health in Germany, and paved his political and social careers. From it, he coined a well known aphorism: "Medicine is a social science, and politics is nothing else but medicine on a large scale". He participated in the Revolution of 1848, which led to his expulsion from Charité the next year. He then published a newspaper Die medicinische Reform (Medical Reform). He took the first Chair of Pathological Anatomy at the University of Würzburg in 1849. After five years, Charité reinstated him to its new Institute for Pathology. He cofounded the political party Deutsche Fortschrittspartei, and was elected to the Prussian House of Representatives and won a seat in the Reichstag. His opposition to Otto von Bismarck's financial policy resulted in an anecdotal "Sausage Duel", although he supported Bismarck in his anti-Catholic campaigns, which he named Kulturkampf ("culture struggle"). A prolific writer, his scientific writings alone exceeded 2,000. 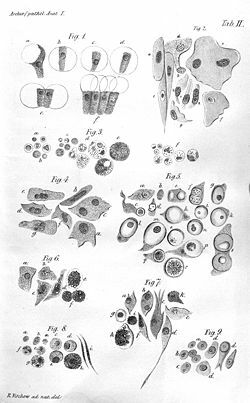 Cellular Pathology (1858), regarded as the root of modern pathology, introduced the third dictum in cell theory: Omnis cellula e cellula ("All cells come from cells"). He was a co-founder of Physikalisch-Medizinische Gesselschaft in 1849 and Deutsche Pathologische Gesellschaft in 1897. He founded journals such as Archiv für pathologische Anatomie und Physiologie und für klinische Medicin (with Benno Reinhardt in 1847, from 1903 under the title Virchows Archiv), and Zeitschrift für Ethnologie (Journal of Ethnology). The latter is published by German Anthropological Association and the Berlin Society for Anthropology, Ethnology and Prehistory, the societies which he also founded. Virchow was the first to describe and christen diseases such as leukemia, chordoma, ochronosis, embolism, and thrombosis. 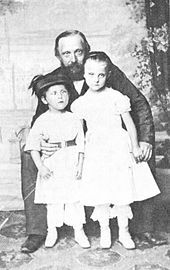 He coined biological terms such as "chromatin", "neuroglia", "agenesis", "parenchyma", "osteoid", "amyloid degeneration", and "spina bifida"; terms such as Virchow's node, Virchow–Robin spaces, Virchow–Seckel syndrome, and Virchow's triad are named after him. His description of the life cycle of a roundworm Trichinella spiralis influenced the practice of meat inspection. He developed the first systematic method of autopsy, and introduced hair analysis in forensic investigation. He was critical of what he described as "Nordic mysticism" regarding the Aryan race. As an anti-evolutionist, he called Charles Darwin an "ignoramus" and his own student Ernst Haeckel a "fool". He described the original specimen of Neanderthal man as nothing but that of a deformed human. Virchow was born in Schievelbein in eastern Pomerania, Prussia (now Świdwin in Poland). He was the only child of Carl Christian Siegfried Virchow (1785–1865) and Johanna Maria née Hesse (1785–1857). His father was a farmer and the city treasurer. Academically brilliant, he always topped in his classes and was fluent in German, Latin, Greek, Hebrew, English, Arabic, French, Italian, and Dutch. He progressed to the gymnasium in Köslin (now Koszalin in Poland) in 1835 with the goal to become a pastor. He graduated in 1839 upon a thesis titled A Life Full of Work and Toil is not a Burden but a Benediction. However, he chose medicine mainly because he considered his voice too weak for preaching. In 1839, he received a military fellowship (a scholarship for gifted children from poor families to become army surgeons) for studying medicine at Friedrich-Wilhelms Institute in Berlin (now Humboldt University of Berlin). He was most influenced by Johannes Peter Müller, his doctoral advisor. He defended his thesis titled de rheumate praesertim corneae (corneal manifestations of rheumatic disease) for medical degree on 21 October 1843. Immediately on graduation, he became subordinate physician to Müller. But shortly after, he joined the Charité Hospital in Berlin for internship. In 1844, he was appointed as medical assistant to the prosector (pathologist) Robert Froriep, from whom he learned microscopy which interested him in pathology. Froriep was also the editor of an abstract journal that specialised in foreign work, which inspired Virchow for scientific ideas of France and England. Virchow published his first scientific paper in 1845 in which he wrote the earliest known pathological descriptions of leukemia. He qualified the medical licensure examination in 1846, and immediately succeeded Froriep as hospital prosector at the Charité. In 1847, he was appointed to his first academic position with the rank of privatdozent. Because his writings did not receive favourable attention from German editors, he founded Archiv für pathologische Anatomie und Physiologie und für klinische Medizin (now known as Virchows Archiv) with a colleague Benno Reinhardt in 1847. He edited alone after Reinhardt's death in 1852 till his own. This journal published critical articles based on the criterion that no papers would be published which contained outdated, untested, dogmatic or speculative ideas. Unlike his German peers, Virchow had great faith in clinical observation, animal experimentation (to determine causes of diseases and the effects of drugs) and pathological anatomy, particularly at the microscopic level, as the basic principles of investigation in medical sciences. He went further and stated that the cell was the basic unit of the body that had to be studied to understand disease. Although the term 'cell' had been coined in the 1665 by an English scientist Robert Hooke, the building blocks of life were still considered to be the 21 tissues of Bichat, a concept described by the French physician Marie Bichat. The Prussian government employed Virchow to study the typhus epidemic in Upper Silesia in 1847–1848. It was from this medical campaign that he developed his ideas on social medicine and politics after seeing the victims and their poverty. Even though he was not particularly successful in combating the epidemic, his 190-paged Report on the Typhus Epidemic in Upper Silesia in 1848 became a turning point in politics and public health in Germany. He returned to Berlin on 10 March 1848, and only eight days later, a revolution broke out against the government in which he played an active part. To fight political injustice he helped founding Die medicinische Reform (Medical Reform), a weekly newspaper for promoting social medicine, in July of that year. The newspaper ran under the banners "medicine is a social science" and "the physician is the natural attorney of the poor". Political pressures forced him to terminate the publication in June 1849, and he was expelled from his official position. In November, he was given an academic appointment and left Berlin for the University of Würzburg to hold Germany's first chair of pathological anatomy. During his six-year period there, he concentrated on his scientific work, including detailed studies on venous thrombosis and cellular theory. His first major work there was a six-volume Handbuch der speciellen Pathologie und Therapie (Handbook on Special Pathology and Therapeutics) published in 1854. In 1856, he returned to Berlin to become the newly created Chair for Pathological Anatomy and Physiology at the Friedrich-Wilhelms-University, as well as Director of the newly built Institute for Pathology on the premises of the Charité. He held the latter post for the next 20 years. Virchow is credited with several very important discoveries. His most widely known scientific contribution is his cell theory, which built on the work of Theodor Schwann. He was one of the first to accept the work of Robert Remak, who showed the origins of cells was the division of pre-existing cells. He did not initially accept the evidence for cell division, believing that it occurs only in certain types of cells. When it dawned on him that Remak might be right, in 1855, he published Remak's work as his own, causing a falling-out between the two. Virchow was particularly influenced in cellular theory by the work of John Goodsir of Edinburgh, whom he described, as "one of the earliest and most acute observers of cell-life both physiological and pathological." Virchow dedicated his magnum opus Die Cellularpathologie to Goodsir. Virchow's cellular theory was encapsulated in the epigram Omnis cellula e cellula ("all cells (come) from cells"), which he published in 1855. (The epigram was actually coined by François-Vincent Raspail, but popularized by Virchow.) It is a rejection of the concept of spontaneous generation, which held that organisms could arise from nonliving matter. For example, maggots were believed to appear spontaneously in decaying meat; Francesco Redi carried out experiments which disproved this notion and coined the maxim Omne vivum ex ovo ("Every living thing comes from a living thing" — literally "from an egg"); Virchow (and his predecessors) extended this to state that the only source for a living cell was another living cell. In 1845, Virchow and John Hughes Bennett independently observed abnormal increases in white blood cells in some patients. 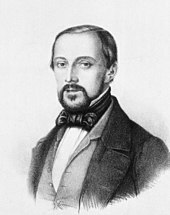 Virchow correctly identified the condition as a blood disease, and named it leukämie in 1847 (later anglicised to leukemia). In 1857, he was the first to describe a type of tumour called chordoma that originated from the clivus (at the base of the skull). Virchow was the first to correctly link the origin of cancers from otherwise normal cells. (His teacher Müller had proposed that cancers originated from cells, but from special cells, which he called blastema.) In 1855, he suggested that cancers arise from the activation of dormant cells (perhaps similar to cells now known as stem cells) present in mature tissue. Virchow believed that cancer is caused by severe irritation in the tissues, and his theory came to be known as chronic irritation theory. He thought, rather wrongly, that the irritation spread in the form of liquid so that cancer rapidly increases. His theory was largely ignored, as he was proved wrong that it was not by liquid, but by metastasis of the already cancerous cells that cancers spread. (First described by Karl Thiersch in the 1860s.) But he made a crucial observation that certain cancers (carcinoma in modern sense) were inherently associated with white blood cells (which are now called macrophages) that produced irritation (inflammation). It was only towards the end of the 20th century that Virchow's theory was taken seriously. It was realised that specific cancers (including those of mesothelioma, lung, prostate, bladder, pancreatic, cervical, esophageal, melanoma, and head and neck) are indeed strongly associated with long-term inflammation. In addition it became clear that long-term use of anti-inflammatory drugs, such as aspirin, reduced cancer risk. Experiments also show that drugs that block inflammation simultaneously inhibit tumour formation and development. Another significant credit relates to the discovery, made approximately simultaneously by Virchow and Charles Emile Troisier, that an enlarged left supraclavicular node is one of the earliest signs of gastrointestinal malignancy, commonly of the stomach, or less commonly, lung cancer. This has become known as Virchow's node and simultaneously Troisier's sign. Virchow is also known for elucidating the mechanism of pulmonary thromboembolism (a condition of blood clotting in the blood vessels), coining the terms embolism and thrombosis. He noted that blood clots in the pulmonary artery originate first from venous thrombi, stating in 1859: "[T]he detachment of larger or smaller fragments from the end of the softening thrombus which are carried along by the current of blood and driven into remote vessels. This gives rise to the very frequent process on which I have bestowed the name of Embolia." Having made these initial discoveries based on autopsies, he proceeded to put forward a scientific hypothesis; that pulmonary thrombi are transported from the veins of the leg and that the blood has the ability to carry such an object. He then proceeded to prove this hypothesis through well-designed experiments, repeated numerous times to consolidate evidence, and with meticulously detailed methodology. This work rebutted a claim made by the eminent French pathologist Jean Cruveilhier that phlebitis led to clot development and therefore coagulation was the main consequence of venous inflammation. This was a view held by many before Virchow's work. Related to this research, Virchow described the factors contributing to venous thrombosis, Virchow's triad. Furthermore, Virchow founded the medical fields of cellular pathology and comparative pathology (comparison of diseases common to humans and animals). His most important work in the field was Cellular Pathology (Die Cellularpathologie in ihrer Begründung auf physiologische und pathologische Gewebelehre) published in 1858, as a collection of his lectures. This is regarded as the basis of modern medical science, and the "greatest advance which scientific medicine had made since its beginning." His very innovative work may be viewed as between that of Giovanni Battista Morgagni, whose work Virchow studied, and that of Paul Ehrlich, who studied at the Charité while Virchow was developing microscopic pathology there. One of Virchow's major contributions to German medical education was to encourage the use of microscopes by medical students, and he was known for constantly urging his students to "think microscopically". He was the first to establish a link between infectious diseases between humans and animals, for which he coined the term "zoonoses". He also introduced scientific terms such as "chromatin", "agenesis", "parenchyma", "osteoid", "amyloid degeneration", and "spina bifida". His concepts on pathology directly opposed humourism, an ancient medical dogma that diseases were due to imbalanced body fluids, hypothetically called humours, that still pervaded. Virchow worked out the life cycle of a roundworm Trichinella spiralis. Virchow noticed a mass of circular white flecks in the muscle of dog and human cadavers, similar to those described by Richard Owen in 1835. He confirmed through microscopic observation that the white particles were indeed the larvae of roundworms, curled up in the muscle tissue. Rudolph Leukart found that these tiny worms could develop into adult roundworms in the intestine of a dog. He correctly asserted that these worms could also cause human helminthiasis. Virchow further demonstrated that if the infected meat is first heated to 137 °F for 10 minutes, the worms could not infect dogs or humans. He established that human roundworm infection occurs through contaminated pork. This directly led to the establishment of meat inspection, which was first adopted in Berlin. Virchow was the first to develop a systematic method of autopsy, based on his knowledge of cellular pathology. The modern autopsy still constitutes his techniques. His first significant autopsy was on a 50-year-old woman in 1845. He found an unusual number of white blood cells, and gave a detailed description in 1847 and named the condition as leukämie. One on his autopsies in 1857 was the first description of vertebral disc rupture. His autopsy on a baby in 1856 was the first description of congenital pulmonary lymphangiectasia (the name given by K. M. Laurence a century later), a rare and fatal disease of the lung. From his experience of post-mortem examinations of a number of cadavers, he published his method in a small book in 1876. His book was the first to describe the techniques of autopsy specifically to examine abnormalities in organs, and retain important tissues for further examination and demonstration. Unlike any other earlier practitioner, he practiced complete surgery of all body parts with body organs dissected one by one. This has become the standard method. Virchow discovered the clinical syndrome which he called ochronosis, a metabolic disorder in which a patient accumulates homogentisic acid in connective tissues and which can be identified by discolouration seen under the microscope. He found the unusual symptom from an autopsy of the corpse of a 67-year-old man on 8 May 1884. This was the first time this abnormal disease affecting cartilage and connective tissue was observed and analysed. His description and coining of the name appeared in the October 1866 issue of Vichows Archiv. [T]he hairs found on the defendant do not possess any so pronounced peculiarities or individualities [so] that no one with certainty has the right to assert that they must have originated from the head of the victim. Virchow developed an interest in anthropology in 1865, when he discovered pile dwellings in northern Germany. In 1869, he co-founded the German Anthropological Association. In 1870 he founded the Berlin Society for Anthropology, Ethnology, and Prehistory (Berliner Gesellschaft für Anthropologie, Ethnologie und Urgeschichte) which was very influential in coordinating and intensifying German archaeological research. He edited its journal Zeitschrift für Ethnologie (Journal of Ethnology), which he founded in 1866, until his death, and was several times (at least fifteen times) its president. In 1870, he led a major excavation of the hill forts in Pomerania. He also excavated wall mounds in Wöllstein in 1875 with Robert Koch, whose paper he edited on the subject. For his contributions in German archaeology, the Rudolf Virchow lecture is held annually in his honour. He made field trips to Asia Minor, the Caucasus, Egypt, Nubia, and other places, sometimes in the company of Heinrich Schliemann. His 1879 journey to the site of Troy is described in Beiträge zur Landeskunde in Troas ("Contributions to the knowledge of the landscape in Troy", 1879) and Alttrojanische Gräber und Schädel ("Old Trojan graves and skulls", 1882). Virchow was an opponent of Darwin's theory of evolution, and particularly skeptical of the emergent thesis of human evolution. On 22 September 1877, he delivered a public address entitled "The Freedom of Science in the Modern State" before the Congress of German Naturalist and Physicians in Munich. There he spoke against the teaching of the theory of evolution in schools, arguing that it was as yet an unproven hypothesis that lacked empirical foundations and that, therefore, its teaching would negatively affect scientific studies. Ernst Haeckel, who had been Virchow's student, later reported that his former professor said that "it is quite certain that man did not descend from the apes...not caring in the least that now almost all experts of good judgment hold the opposite conviction." Virchow became one of the leading opponents on the debate over the authenticity of Neanderthal, discovered in 1856, as distinct species and ancestral to modern humans. He himself examined the original fossil in 1872, and presented his observations before the Berliner Gesellschaft für Anthropologie, Ethnologie und Urgeschichte. He stated that the Neanderthal had not been a primitive form of human, but an abnormal human being, who, judging by the shape of his skull, had been injured and deformed, and considering the unusual shape of his bones, had been arthritic, rickety and feeble. With such an authority, the fossil was rejected as new species. With this reasoning, Virchow "judged Darwin an ignoramus and Haeckel a fool and was loud and frequent in the publication of these judgments." On 22 September 1877, at the Fiftieth Conference of the German Association of Naturalists and Physician held in Munich, Haeckel pleaded for introducing evolution in the public school curricula, and tried to dissociate Darwinism from social Darwinism. His campaign was because of Herman Müller, a school teacher who was banned because of his teaching a year earlier on the inanimate origin of life from carbon. This resulted in prolonged public debate with Virchow. A few days later Virchow responded that Darwinism was only a hypothesis, and morally dangerous to students. This severe criticism of Darwinism was immediately taken up by the London Times, from which further debates erupted among English scholars. Haeckel wrote his arguments in the October issue of Nature titled "The Present Position of Evolution Theory", to which Virchow responded in the next issue with an article "The Liberty of Science in the Modern State". The debate led Haeckel to write a full book Freedom in Science and Teaching in 1879. That year the issue was discussed in the Prussian House of Representatives and the verdict was in favour of Virchow. In 1882 the Prussian education policy officially excluded natural history in schools. Years later, the noted German physician Carl Ludwig Schleich, would recall a conversation he held with Virchow, who was a close friend of his: "...On to the subject of Darwinism. "I don't believe in all this," Virchow told me. "if I lie on my sofa and blow the possibilities away from me, as another man may blow the smoke of his cigar, I can, of course, sympathize with such dreams. But they don't stand the test of knowledge. Haeckel is a fool. That will be apparent one day. As far as that goes, if anything like transmutation did occur it could only happen in the course of pathological degeneration!". The intermediate form is unimaginable save in a dream... We cannot teach or consent that it is an achievement that man descended from the ape or other animal. Virchow's antievolutionism, like that of Albert von Kölliker and Thomas Brown, did not come from religion, since he was not a believer. Virchow believed that Haeckel's monist propagation of social Darwinism was in its nature politically dangerous and anti-democratic, and he also criticized it because he saw it as related to the emergent socialist movement in Germany, ideas about cultural superiority, and militarism. In 1885, he launched a study of craniometry, which gave surprising results contradictory to contemporary scientific racist theories on the "Aryan race", leading him to denounce the "Nordic mysticism" at the 1885 Anthropology Congress in Karlsruhe. Josef Kollmann, a collaborator of Virchow, stated at the same congress that the people of Europe, be they German, Italian, English or French, belonged to a "mixture of various races", further declaring that the "results of craniology" led to a "struggle against any theory concerning the superiority of this or that European race" over others. He analysed the hair, skin, and eye colour of 6,758,827 schoolchildren to identify the Jews and Aryans. His findings, published in 1886 and concluding that there could be neither a Jewish nor a German race, were regarded as a blow to anti-Semitism and the existence of an "Aryan race". Virchow did not believe in the germ theory of diseases, as advocated by Louis Pasteur and Robert Koch. He proposed that diseases came from abnormal activities inside the cells, not from outside pathogens. He believed that epidemics were social in origin, and the way to combat epidemics was political, not medical. He regarded germ theory as a hindrance to prevention and cure. He considered social factors such as poverty major causes of disease. He even attacked Koch's and Ignaz Semmelweis' policy of handwashing as an antiseptic practice. He postulated that germs were only using infected organs as habitats, but were not the cause, and stated, "If I could live my life over again, I would devote it to proving that germs seek their natural habitat: diseased tissue, rather than being the cause of diseased tissue". Medicine is a social science, and politics is nothing else but medicine on a large scale. Medicine, as a social science, as the science of human beings, has the obligation to point out problems and to attempt their theoretical solution: the politician, the practical anthropologist, must find the means for their actual solution... Science for its own sake usually means nothing more than science for the sake of the people who happen to be pursuing it. Knowledge which is unable to support action is not genuine – and how unsure is activity without understanding... If medicine is to fulfill her great task, then she must enter the political and social life... The physicians are the natural attorneys of the poor, and the social problems should largely be solved by them. Virchow actively worked for social change to fight poverty and diseases. His methods involved pathological observations and statistical analyses. He called this new field of social medicine a "social science". His most important influences could be noted in Latin America, where his disciples introduced his social medicine. For example, his student Max Westenhöfer became Director of Pathology at the medical school of the University of Chile, becoming the most influential advocate. One of Westenhöfer's students, Salvador Allende, through social and political activities based on Virchow's doctrine, became the 29th President of Chile (1970-1973). Virchow made himself known as a pronounced democrat in the year of revolutions in Germany (1848). His political views are evident in his Report on the Typhus Outbreak of Upper Silesia, where he states that the outbreak could not be solved by treating individual patients with drugs or with minor changes in food, housing, or clothing laws, but only through radical action to promote the advancement of an entire population, which could only be achieved by "full and unlimited democracy" and "education, freedom and prosperity". These radical statements and his minor part in the revolution caused the government to remove him from his position in 1849, although within a year he was reinstated as prosector 'on probation'. Prosector was a secondary position in the hospital. This secondary position in Berlin convinced him to accept the chair of pathological anatomy at the medical school in the provincial town of Würzburg, where he continued his scientific research. Six years later, he had attained fame in scientific and medical circles, and was reinstated at Charité Hospital. In 1859, he became a member of the Municipal Council of Berlin and began his career as a civic reformer. Elected to the Prussian Diet in 1862, he became leader of the Radical or Progressive party; and from 1880 to 1893, he was a member of the Reichstag. He worked to improve the health-care conditions for Berlin citizens, especially by working towards modern water and sewer systems. Virchow is credited as a founder of anthropology and of social medicine, frequently focusing on the fact that disease is never purely biological, but often socially derived or spread. As a cofounder and member of the liberal party Deutsche Fortschrittspartei he was a leading political antagonist of Bismarck. 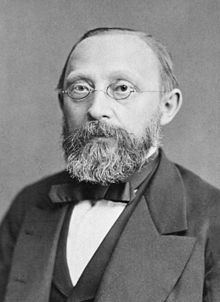 He was opposed to Bismarck’s excessive military budget, which angered Bismarck sufficiently that he challenged Virchow to a duel in 1865. One version of the events has Virchow declining because he considered dueling an uncivilized way to solve a conflict. A second version has passed into legend, but was well documented in the contemporary scientific literature. It has Virchow, having been the one challenged and therefore entitled to choose the weapons, selecting two pork sausages, a normal sausage and another one, loaded with Trichinella larvae. His challenger declined the proposition as risky. 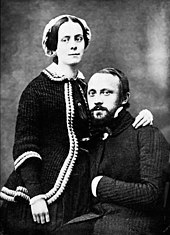 Virchow supported Bismarck in an attempt to reduce the political and social influence of the Catholic Church, between 1871 and 1887. He remarked that the movement was acquiring "the character of a great struggle in the interest of humanity". He called it Kulturkampf ("culture struggle") during the discussion of Paul Ludwig Falk's May Laws (Maigesetze). Virchow was respected in Masonic circles, and according to one source may have been a freemason, though no official record of this has been found. Virchow was an agnostic Protestant. Virchow broke his thigh bone on 4 January 1902, jumping off a running streetcar while exiting the electric tramway. Although he anticipated full recovery, the fractured femur never healed, and restricted his physical activity. His health gradually deteriorated and he died of heart failure after eight months, on 5 September 1902, in Berlin. A state funeral was held on 9 September in the Assembly Room of the Magistracy in the Berlin Town Hall, which was decorated with laurels, palms and flowers. He was buried in the Alter St.-Matthäus-Kirchhof in Schöneberg, Berlin. His tomb was shared by his wife on 21 February 1913. In June 1859, Virchow was elected to Berlin Chamber of Representatives. In 1860, he was elected official Member of the Königliche Wissenschaftliche Deputation für das Medizinalwesen (Royal Scientific Board for Medical Affairs). In 1861, he was elected foreign member of the Royal Swedish Academy of Sciences. In March 1862, he was elected to the Prussian House of Representatives. In 1873, he was elected to the Prussian Academy of Sciences. He declined to be ennobled as "von Virchow," he was nonetheless designated Geheimrat ("privy councillor") in 1894. In 1880, he was elected member of the Reichstag of the German Empire. In 1881, Rudolf-Virchow-Foundation was established on the occasion of his 60th birthday. In 1892, he was appointed Rector of the Berlin University. In 1892, he was awarded the British Royal Society's Copley Medal. The Rudolf Virchow Center, a biomedical research center in the University of Würzburg was established in January 2002. Rudolf Virchow Award is given by the Society for Medical Anthropology for research achievements in medical anthropology. Rudolf Virchow lecture, an annual public lecture, is organised by the Römisch-Germanisches Zentralmuseum Mainz, for eminent scientists in the field of palaeolithic archaeology. Rudolf Virchow Medical Society is based in New York, and offers Rudolf Virchow Medal. Campus Virchow Klinikum is named for the campus of Charité hospital. The Rudolf Virchow Monument, a muscular limestone statue, was erected in 1910 at Karlplatz in Berlin. Langenbeck-Virchow-Haus was built in 1915 in Berlin, jointly honouring Virchow and Bernhard von Langenbeck. Originally a medical centre, the building is now used as conference centre of the German Surgical Association (Deutsche Gesellschaft für Chirurgie) and the Berlin Medical Association (BMG-Berliner Medizinische Gesellschaft). The Rudolf Virchow Study Center is instituted by the European University Viadrina for compiling of the complete works of Virchow. Virchow Hill in Antarctica is named Die Cellularpathologie after Rudolf Virchow. Virchow's Law, during craniosynostosis, skull growth is restricted to a plane perpendicular to the affected, prematurely fused suture and is enhanced in a plane parallel to it. Virchow–Seckel syndrome, a very rare disease also known as "bird-headed dwarfism"
Vorlesungen über Cellularpathologie in ihrer Begründung auf physiologischer und pathologischer Gewebelehre, his chief work (1859): The fourth edition of this work formed the first volume of Vorlesungen über Pathologie below. ^ "Virchow". The American Heritage Dictionary of the English Language. ^ Silver, G A (1987). "Virchow, the heroic model in medicine: health policy by accolade". American Journal of Public Health. 77 (1): 82–88. doi:10.2105/AJPH.77.1.82. PMC 1646803. PMID 3538915. ^ Nordenström, Jörgen (2012). The Hunt for the Parathyroids. Chichester, West Sussex: John Wiley & Sons. p. 10. ISBN 978-1-118-34339-5. ^ Huisman, Frank; Warner, John Harley (2004). Locating Medical History: The Stories and Their Meanings. Baltimore: Johns Hopkins University Press. p. 415. ISBN 978-0-8018-7861-9. ^ a b c d e Weisenberg, Elliot (2009). "Rudolf Virchow, pathologist, anthropologist, and social thinker". Hektoen International Journal. Online. Retrieved 24 November 2014. ^ a b "Kulturkampf". Encyclopædia Britannica. Retrieved 27 November 2014. ^ a b c d Buikstra, Jane E.; Roberts, Charlotte A. (2012). The Global History of Paleopathology: Pioneers and Prospects. Oxford: Oxford University Press. pp. 388–390. ISBN 978-0-1953-8980-7. ^ a b Kuiper, Kathleen (2010). The Britannica Guide to Theories and Ideas That Changed the Modern World. New York, NY: Britannica Educational Pub. in association with Rosen Educational Services. p. 28. ISBN 978-1-61530-029-7. ^ Skoczylas, M; Pierzak-Sominka, J; Rudnicki, J (2013). "O formach aktywności dydaktycznej Rudolfa Virchowa w zakresie medycyny". Problems of Applied Sciences. 1: 197–200. ^ "Zeitschrift für Ethnologie". Retrieved 29 November 2014. ^ "Rudolf Virchow". Encyclopædia Britannica. Retrieved 29 November 2014. ^ a b Oien, Cary T (2009). "Forensic Hair Comparison: Background Information for Interpretation". Forensic Science Communications. 11 (2): Online. ^ a b Silberstein, Laurence J.; Cohn, Robert L. (1994). The Other in Jewish Thought and History: Constructions of Jewish Culture and Identity. New York: New York University Press. pp. 375–376. ISBN 978-0-8147-7990-3. ^ a b Glick, Thomas F. (1988). The Comparative reception of Darwinism. Chicago: University of Chicago Press. pp. 86–87. ISBN 978-0-226-29977-8. ^ "Virchow, Rudolf". Appletons' Cyclopaedia for 1902. NY: D. Appleton & Company. 1903. pp. 520–521. ^ a b "Rudolf Ludwig Carl Virchow". Encyclopedia of World Biography. HighBeam™ Research, Inc. 2004. Retrieved 24 November 2014. ^ a b Weller, Carl Vernon (1921). "Rudolf Virchow--Pathologist". The Scientific Monthly. 13 (1): 33–39. Bibcode:1921SciMo..13...33W. JSTOR 6580. ^ a b "Rudolf Ludwig Karl Virchow". Whonamedit?. Retrieved 24 November 2014. ^ Bagot, Catherine N.; Arya, Roopen (2008). "Virchow and his triad: a question of attribution". British Journal of Haematology. 143 (2): 180–190. doi:10.1111/j.1365-2141.2008.07323.x. ISSN 1365-2141. Rines, George Edwin, ed. (1920). "Virchow, Rudolf" . Encyclopedia Americana. ^ Taylor, R; Rieger, A (1985). "Medicine as social science: Rudolf Virchow on the typhus epidemic in Upper Silesia". International Journal of Health Services. 15 (4): 547–559. doi:10.2190/xx9v-acd4-kuxd-c0e5. PMID 3908347. ^ Azar, HA (1997). "Rudolf Virchow, not just a pathologist: a re-examination of the report on the typhus epidemic in Upper Silesia". Annals of Diagnostic Pathology. 1 (1): 65–71. doi:10.1016/S1092-9134(97)80010-X. PMID 9869827. ^ a b Brown, Theodore M.; Fee, Elizabeth (2006). "Rudolf Carl Virchow". American Journal of Public Health. 96 (12): 2104–2105. doi:10.2105/AJPH.2005.078436. PMC 1698150. PMID 17077410. ^ a b c d "Virchow's Biography". Berliner Medizinhistorisches Museum der Charité. Retrieved 24 November 2014. ^ a b Boak, Arthur ER (1921). "Rudolf Virchow--Anthropologist and Archeologist". The Scientific Monthly. 13 (1): 40–45. Bibcode:1921SciMo..13...40B. JSTOR 6581. ^ Rutherford, Adam (August 2009). "The Cell: Episode 1 The Hidden Kingdom". BBC4. ^ Tixier-Vidal, Andrée (2011). "De la théorie cellulaire à la théorie neuronale". Biologie Aujourd'hui (in French). 204 (4): 253–266. doi:10.1051/jbio/2010015. PMID 21215242. ^ Tan SY, Brown J (July 2006). "Rudolph Virchow (1821–1902): "pope of pathology"" (PDF). Singapore Med J. 47 (7): 567–8. PMID 16810425. ^ Degos, L (2001). "John Hughes Bennett, Rudolph Virchow... and Alfred Donné: the first description of leukemia". The Hematology Journal. 2 (1): 1. doi:10.1038/sj/thj/6200090. PMID 11920227. ^ Kampen, Kim R. (2012). "The discovery and early understanding of leukemia". Leukemia Research. 36 (1): 6–13. doi:10.1016/j.leukres.2011.09.028. PMID 22033191. ^ Mukherjee, Siddhartha (16 November 2010). The Emperor of All Maladies: A Biography of Cancer. Simon and Schuster. ISBN 978-1-4391-0795-9. Retrieved 6 September 2011. ^ Hirsch, Edwin F (1923). "Sacrococcygeal Chordoma". JAMA. 80 (19): 1369–70. doi:10.1001/jama.1923.02640460019007. ^ Lopes, Ademar; Rossi, Benedito Mauro; Silveira, Claudio Regis Sampaio; Alves, Antonio Correa (1996). "Chordoma: retrospective analysis of 24 cases". Sao Paulo Medical Journal. 114 (6): 1312–1316. doi:10.1590/S1516-31801996000600006. ^ Wagner, RP (1999). "Anecdotal, historical and critical commentaries on genetics. Rudolph Virchow and the genetic basis of somatic ecology". Genetics. 151 (3): 917–920. PMC 1460541. PMID 10049910. ^ Goldthwaite, Charles A. (20 November 2011). "Are Stem Cells Involved in Cancer?". National Institutes of Health. Retrieved 22 December 2014. ^ "The History of Cancer". American Cancer Society, Inc. Retrieved 22 December 2014. ^ Mandal, Aranya (2009-12-02). "Cancer History". News-Medical.net. Retrieved 22 December 2014. ^ Balkwill, Fran; Mantovani, Alberto (2001). "Inflammation and cancer: back to Virchow?". The Lancet. 357 (9255): 539–545. doi:10.1016/S0140-6736(00)04046-0. PMID 11229684. ^ Coussens, LM; Werb, Z (2002). "Inflammation and cancer". Nature. 420 (6917): 860–867. Bibcode:2002Natur.420..860C. doi:10.1038/nature01322. PMC 2803035. PMID 12490959. ^ Ostrand-Rosenberg, S.; Sinha, P. (2009). "Myeloid-derived suppressor cells: linking inflammation and cancer". The Journal of Immunology. 182 (8): 4499–4506. doi:10.4049/jimmunol.0802740. PMC 2810498. PMID 19342621. ^ Baron, John A.; Sandler, Robert S. (2000). "Nonsteroidal anti-inflammatory drugs and cancer prevention". Annual Review of Medicine. 51 (1): 511–523. doi:10.1146/annurev.med.51.1.511. PMID 10774479. ^ Mantovani, Alberto; Allavena, Paola; Sica, Antonio; Balkwill, Frances (2008). "Cancer-related inflammation" (PDF). Nature. 454 (7203): 436–444. Bibcode:2008Natur.454..436M. doi:10.1038/nature07205. hdl:2434/145688. PMID 18650914. ^ Lucas, Charles T. "Virchow's mistake". The Innominate Society of Louisville. Retrieved 27 November 2014. ^ Cardesa, Antonio; Zidar, Nina; Alos, Llucia; Nadal, Alfons; Gale, Nina; Klöppel, Günter (2011). "The Kaiser's cancer revisited: was Virchow totally wrong?". Virchows Archiv. 458 (6): 649–657. doi:10.1007/s00428-011-1075-0. PMID 21494762. ^ Ober, WB (1970). "The case of the Kaiser's cancer". Pathology Annual. 5: 207–216. PMID 4939999. ^ Wagener, D.J.Th. (2009). The History of Oncology. Houten: Springer. pp. 104–105. ISBN 978-9-0313-6143-4. ^ Oliva, H; Aguilera, B (1986). "The harmful biopsies of Kaiser Frederick III". Revista Clinica Espanola (in Spanish). 178 (8): 409–411. doi:10.1056/NEJM198503073121022. PMID 3526428. ^ Depprich, Rita A.; Handschel, Jörg G.; Fritzemeier, Claus U.; Engers, Rainer; Kübler, Norbert R. (2006). "Hybrid verrucous carcinoma of the oral cavity: A challenge for the clinician and the pathologist". Oral Oncology Extra. 42 (2): 85–90. doi:10.1016/j.ooe.2005.09.006. ^ Loh, Keng Yin; Yushak, Abd Wahab (2007). "Virchow's Node (Troisier's Sign)". New England Journal of Medicine. 357 (3): 282. doi:10.1056/NEJMicm063871. PMID 17634463. ^ Sundriyal, D; Kumar, N; Dubey, S. K; Walia, M (2013). "Virchow's node". Case Reports. 2013: bcr2013200749. doi:10.1136/bcr-2013-200749. PMC 3794256. PMID 24031077. ^ Kumar, D. R.; Hanlin, E.; Glurich, I.; Mazza, J. J.; Yale, S. H. (2010). "Virchow's contribution to the understanding of thrombosis and cellular biology". Clinical Medicine & Research. 8 (3–4): 168–172. doi:10.3121/cmr.2009.866. PMC 3006583. PMID 20739582. ^ Dalen, James E. (2003). Venous Thromboembolism. New York: Marcel Decker, Inc. ISBN 978-0-8247-5645-1. ^ Reese, DM (1998). "Fundamentals--Rudolf Virchow and modern medicine". The Western Journal of Medicine. 169 (2): 105–108. PMC 1305179. PMID 9735691. ^ Knatterud, Mary E. (2002). First Do No Harm: Empathy and the Writing of Medical Journal Articles. New York: Routledge. pp. 43–45. ISBN 978-0-4159-3387-2. ^ a b c Schultz, Myron (2008). "Rudolf Virchow". Emerg Infect Dis. 14 (9): 1480–1481. doi:10.3201/eid1409.086672. PMC 2603088. ^ Titford, M. (21 April 2010). "Rudolf Virchow: Cellular Pathologist". Laboratory Medicine. 41 (5): 311–312. doi:10.1309/LM3GYQTY79CPYLBI. ^ a b c Etzioni, Amos; Ochs, Hans D. (2014). Primary Immunodeficiency Disorders: A Historic and Scientific Perspective. Oxford, UK: Elsevier Academic Press. pp. 3–4. ISBN 978-0-12-407179-7. ^ "Discovery of Life Cycle". Trichinella.org. Archived from the original on 19 March 2014. Retrieved 24 November 2014. ^ Nöckler, K (2000). "Current status of the discussion on the certification of so-called "Trichinella-free areas"". Berliner und Munchener Tierarztliche Wochenschrift. 113 (4): 134–138. PMID 10816912. ^ Saunders, L. Z. (2000). "Virchow's Contributions to Veterinary Medicine: Celebrated Then, Forgotten Now". Veterinary Pathology. 37 (3): 199–207. doi:10.1354/vp.37-3-199. PMID 10810984. ^ "Autopsy: History of autopsy". Encyclopædia Britannica. Retrieved 26 November 2014. ^ Maurice-Williams, R.S. (2013). Spinal Degenerative Disease. Butterworth-Heinemann. p. 2. ISBN 978-1-4831-9340-3. ^ Hwang, Joon Ho; Kim, Joo Heon; Hwang, Jung Ju; Kim, Kyu Soon; Kim, Seung Yeon (2014). "Pneumonectomy case in a newborn with congenital pulmonary lymphangiectasia". Journal of Korean Medical Science. 29 (4): 609–13. doi:10.3346/jkms.2014.29.4.609. PMC 3991809. PMID 24753713. ^ Saukko, Pekka J; Pollak, Stefan (2009). "Autopsy". Wiley Encyclopedia of Forensic Science. John Wiley & Sons, Ltd. doi:10.1002/9780470061589.fsa036. ISBN 9780470018262. ^ Finkbeiner, Walter E; Ursell, Philip C; Davis, Richard L (2009). Autopsy Pathology: A Manual and Atlas (2 ed.). Philadelphia, PA: Elsevier Health Sciences. p. 6. ISBN 978-1-4160-5453-5. ^ Skowronek, R; Chowaniec, C (2010). "The evolution of autopsy technique--from Virchow to Virtopsy". Archiwum Medycyny Sadowej I Kryminologii. 60 (1): 48–54. PMID 21180108. ^ Virchow, RL (1966) . "Rudolph Virchow on ochronosis.1866". Arthritis and Rheumatism. 9 (1): 66–71. doi:10.1002/art.1780090108. PMID 4952902. ^ Benedek, Thomas G. (1966). "Rudolph virchow on ochronosis". Arthritis & Rheumatism. 9 (1): 66–71. doi:10.1002/art.1780090108. PMID 4952902. ^ Wilke, Andreas; Steverding, Dietmar (2009). "Ochronosis as an unusual cause of valvular defect: a case report". Journal of Medical Case Reports. 3 (1): 9302. doi:10.1186/1752-1947-3-9302. PMC 2803825. PMID 20062791. ^ Inman, Keith; Rudin, Norah (2000). Principles and Practice of Criminalistics the Profession of Forensic Science. Hoboken: CRC Press. p. 50. ISBN 9781420036930. Reynolds, Francis J., ed. (1921). "Virchow, Rudolf" . Collier's New Encyclopedia. New York: P.F. Collier & Son Company. ^ Wendt, H. 1960. Tras la huellas de Adán, 3ª edición. Editorial Noguer, Barcelona-México, 566 pp. ^ Weiss, Sheila Faith (1987). Race Hygiene and National Efficiency: The Eugenics of Wilhelm Schallmayer. Berkeley: University of California Press. pp. 67, 179. ISBN 978-0-520-05823-1. ^ Porter, Theodore M. (2006). Karl Pearson: The Scientific Life in a Statistical Age. Princeton: Princeton University Press. p. 36. ISBN 978-1-400-83570-6. ^ Weindling, Paul (1993). Health, Race and German Politics Between National Unification and Nazism, 1870-1945. Cambridge: Cambridge University Press. p. 43. ISBN 9780521423977. ^ Hawkins, Mike (1998). Social Darwinism in European and American thought, 1860-1945 : Nature as Model and Nature as Threat (Reprinted ed.). Cambridge: Cambridge University Press. p. 138. ISBN 9780521574341. ^ Moore, Randy; Decker, Mark; Cotner, Sehoya (2010). Chronology of the Evolution-creationism Controversy. Santa Barbara, Calif.: Greenwood Press/ABC-CLIO. pp. 121–122. ISBN 9780313362873. ^ Regal, Brian (2004). Human Evolution : A Guide to Debates. Santa Barbara, Calif: ABC-Clio. ISBN 9781851094189. ^ Zimmerman, Andrew (2008). "Anti-Semitism as Skill: Rudolf Virchow's Schulstatistik and the Racial Composition of Germany". Central European History. 32 (4): 409–429. doi:10.1017/S0008938900021762. JSTOR 4546903. ^ "Rudolf Virchow, 1821–1902". The President and Fellows of Harvard College. Retrieved 8 July 2014. ^ Berkowsky, Bruce. "The Germ Theory: The Traditional Naturopathic Perspective - Part I". Natural Health Science. Joseph Ben Hil-Meyer Research, Inc. Retrieved 8 July 2014. ^ Mackenbach, J P (2009). "Politics is nothing but medicine at a larger scale: reflections on public health's biggest idea". Journal of Epidemiology & Community Health. 63 (3): 181–184. doi:10.1136/jech.2008.077032. PMID 19052033. ^ Wittern-Sterzel, R (2003). "Politics is nothing else than large scale medicine"--Rudolf Virchow and his role in the development of social medicine". Verhandlungen der Deutschen Gesellschaft Fur Pathologie. 87: 150–157. PMID 16888907. ^ J R A (2006). "Virchow misquoted, part‐quoted, and the real McCoy". Journal of Epidemiology and Community Health. 60 (8): 671. PMC 2588080. ^ "Rudolf Virchow on Pathology Education". The Pathology Guy. Retrieved 28 November 2014. ^ Porter, Dorothy (2006). "How did social medicine evolve, and where is it heading?". PLoS Medicine. 3 (10): e399. doi:10.1371/journal.pmed.0030399. PMC 1621092. PMID 17076552. ^ Waitzkin, H; Iriart, C; Estrada, A; Lamadrid, S (2001). "Social medicine then and now: lessons from Latin America". American Journal of Public Health. 91 (10): 1592–601. doi:10.2105/ajph.91.10.1592. PMC 1446835. PMID 11574316. ^ Virchow, Rudolf Carl (2006). "Report on the Typhus Epidemic in Upper Silesia". American Journal of Public Health. 96 (12): 2102–5. doi:10.2105/AJPH.96.12.2102. PMC 1698167. PMID 17123938. ^ Isaac Asimov (1991). Treasury of Humor. Mariner Books. p. 202. ISBN 978-0-395-57226-9. ^ Cardiff, Robert D; Ward, Jerrold M; Barthold, Stephen W (2008). "'One medicine—one pathology': are veterinary and human pathology prepared?". Laboratory Investigation. 88 (1): 18–26. doi:10.1038/labinvest.3700695. PMID 18040269. ^ Marco Steinert Santos (2008-09-01). Virchow: medicina, ciência e sociedade no seu tempo. Imprensa da Univ. de Coimbra. pp. 140–. ISBN 978-989-8074-45-4. Retrieved 7 May 2012. ^ "Prof. Virchow is Dead. Famous Scientist's Long Illness Ended Yesterday". New York Times. 5 September 1902. Retrieved 4 August 2012. ^ "Prof. Virchow's Funeral. Distinguished Scholars, Scientists, and Doctors in the Throng That Attends the Ceremonies in Berlin". New York Times. 9 September 1902. Retrieved 4 August 2012. 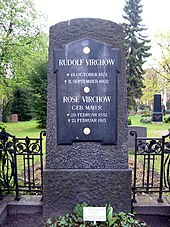 ^ "Rudolf Virchow tomb". HimeTop. Retrieved 28 November 2014. ^ "The Rudolf Virchow Center". The Rudolf Virchow Center. Archived from the original on 29 November 2014. Retrieved 24 November 2014. ^ "Call for Submissions: Rudolf Virchow Awards". Society for Medical Anthropology. 2014-05-13. Retrieved 24 November 2014. ^ "Rudolf Virchow Medal". Oregon State University Libraries' Special Collections & Archives Research Center. Retrieved 24 November 2014. ^ "Rudolf Virchow monument". HimeTop. Retrieved 28 November 2014. ^ "Langenbeck-Virchow-Haus" (in German). Retrieved 28 November 2014. ^ "Rudolf Virchow Study Center: Rudolf Virchow and Transcultural Health Sciences". European University Viadrina. Retrieved 29 November 2014. Becher (1891). Rudolf Virchow, Berlin. Pagel, J. L. (1906). Rudolf Virchow, Leipzig. Ackerknecht, Erwin H. (1953) Rudolf Virchow: Doctor, Statesman, Anthropologist, Madison. Virchow, RLK (1978). Cellular pathology. 1859 special ed., 204–207 John Churchill London, UK. Eisenberg L. (1986). "Rudolf Virchow: the physician as politician". Medicine and War. 2 (4): 243–250. doi:10.1080/07488008608408712. Rather, L. J. (1990). A Commentary on the Medical Writings of Rudolf Virchow: Based on Schwalbe's Virchow-Bibliographie, 1843-1901. San Francisco: Norman Publishing. ISBN 978-0-9304-0519-9. Wikimedia Commons has media related to Rudolf Virchow. Wikisource has the text of the 1911 Encyclopædia Britannica article Virchow, Rudolf. Article on Rudolf Virchow in Nautilus retrieved on 28 January 2017.